A strong auction performance for Italy this morning demonstrates banks' willingness to use cheap financing and low capital requirements to jump in on a quick carry trade and have eligible collateral for their liquidity requirements. NYT: The Italian Treasury allotted all of the €8.5 billion of the 12-month bills it had targeted for sale, with its yields falling by half or more. 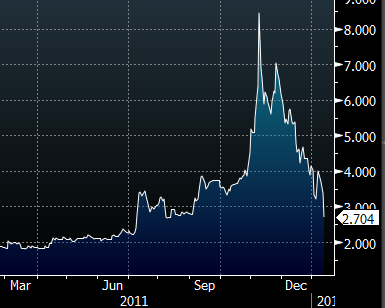 The 1-year Italian bill rate came off sharply. The current yield is 2.7% after peaking back in October at around 8.5%. In spite of this impressive performance, a great deal of risk is still priced into the longer-term paper. The yield curve has gone from "inverted" to "extremely steep" as the probability of default shifts further out in time. 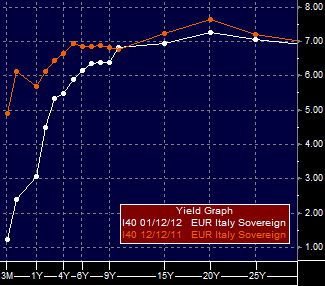 The chart below compares the current Italian yield curve with the one from a month ago.